I tell ya…I am obsessed with Snowmen…so I apologize in advance for yet another snowman related post. 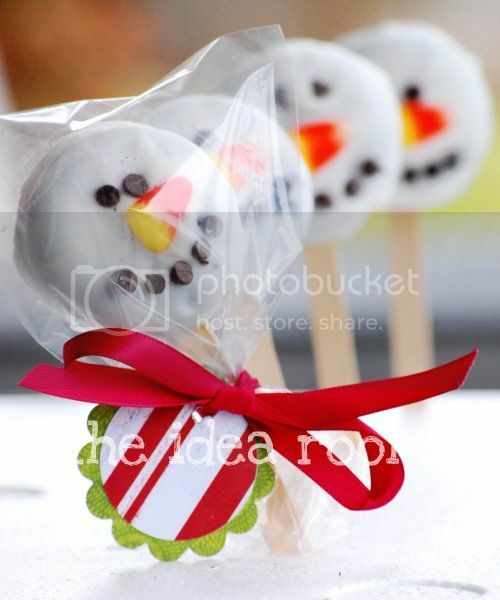 This time I wanted to make some Oreo Snowman treats that were similar to these Reindeer Pops. Simply take some Double Stuff Oreos (or Oreo Cakesters) and insert a popsicle or sucker stick into the frosting in the middle of the Oreo. Melt some white chocolate. I used white CandiQuik which can be found in the baking supply area of your grocery store. It melts very quickly and covers very nicely. Then set them to dry on some wax paper. Add mini chocolate chips for the eyes and the mouth. Add a candy corn for the nose. That’s it. If needed, you can trim the edges of the chocolate with some kitchen scissors to make a nice smooth edge. Then, since I had some leftover melted CandiQuik, I made some fun melted snowmen. Pretty much using the same process. Just pour a puddle of CandiQuik onto the wax paper and then place a dipped oreo on the puddle. Make the eyes, mouth and nose with the mini chocolate chips and a candy corn. This time you can add a scarf using a piece of licorice, some buttons (more mini chocolate chips) and some arms using a pretzel stick broken in half. These would be a fun little gift or a fun party treat! They taste pretty darn good too! Hope you enjoy them! Amy! These are sooo cute :) Love them! I LOVE the melted snowmen, Amy! These are adorable. The little licorice scarf is the best! 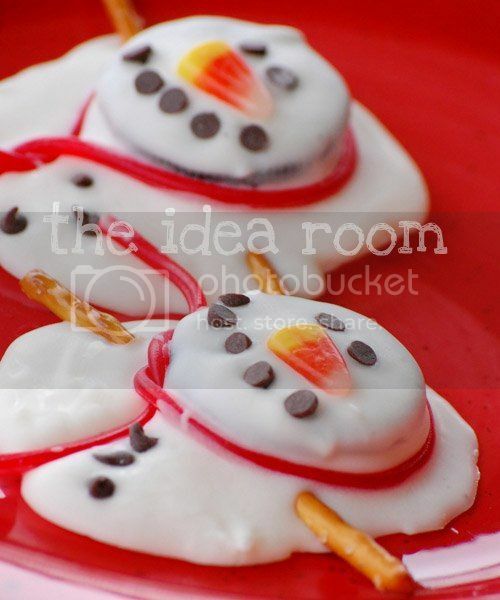 So often we try to spend time making the perfect little treats – but look at how cute these "melted" snowmen are! Love it. Thanks for the post. I absolutely love the melted snowman! I am going to make these for my daughter to give out at her class party Friday! Thanks for the inspiration!!! Now that is cute! Thanks for sharing. Those are too cute! And they'd be great for the kids to make too! Thank you for sharing! I love them.. they are just so cute! Snowmen are my favorite! I decorate mostly with snowmen for winter, that way I can leave it up longer than just the holiday specific stuff :) Love these cookies! I have to make 4 doz cookies today for my preschooler's concert and found your blog and this post very helpful! Thanks so much for making me the coolest cookie Momma! That is SUCH a CUTE idea!!! Love it! My mother-in-law made these as cookies for the kids and used orange wedges as the noses. My son sucked all the chocolate chips off and left the rest. My daughter inhaled hers and my nephew picked off all the noses and left the rest. I got the leftover carnage and they were so good! Love Love these… I love snowmen too! I dont even know how I stumbled onto your blog this weekend, but I just shared it with 867 of my closest friends (on facebook). Soooo I love this!! I'm the dessert maker/bringer person on the holidays and I've been looking for a fun dessert on Christmas and this is it!! I love love your this cute little snowman! Those melted versions are ADORABLE! I have a thing for snowmen too, so I love this idea!! Thanks so much for all of your wonderful ideas!! I can't wait to make neighbor gifts this year because of all of your neat ideas! Your snowmen pops are adorable and fun for kids but what 'big' kid wouldn't love the melted version! Too cute! Love the melted snowman!! So cute! I wonder where to get a good wrapper to put it in like you show in the photo? These will be awesome for Christmas treats for my son's 5th grade Sunday School class tomorrow since they are too "mature" for Santa cookies, lol.. Since I'm out of Oreos and not going back to Walmart tonight, I'm using Ritz crackers with Peanut Butter in between. The teacher says no one has food allergies, thank goodness! Love these! I posted the ones we made for a party with a link to your blog today. Thanks! Love it! I am making these for work! Thanks for sharing! I adore these!!! I am completely obsessed with snowmen so these are perfect to make with my kids this year as gifts. My oreos fell apart as I was dipping. How do you keep that from happening? How cute- I’m going to make these for my “adopted” seniors at the high school where I work!!! 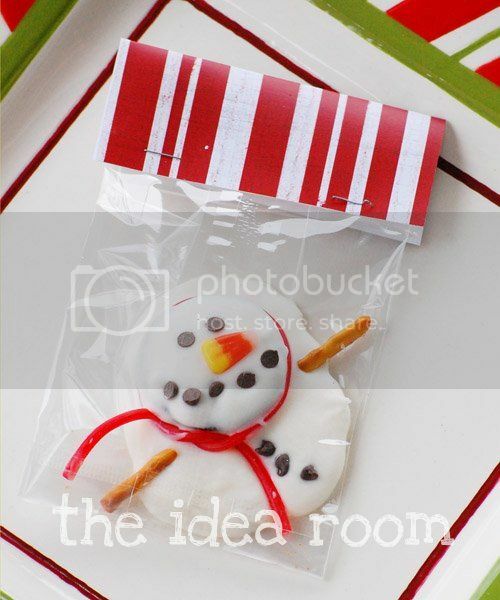 The plastic package she used for the melted snowman is super cute, anyone know where I can find that??? The plastic bags can be found at most craft stores. They are usually found in the baking section. How do you get the stick in the cookies without breaking the cookie? Also did you dip the cookies or just used the CandiQuik to “glue” the eyes, nose & mouth on with? Oh Awesome! I recently started hosting a monthly party for homeschoolers in our area, a good group of friends that we have who all homeschool. 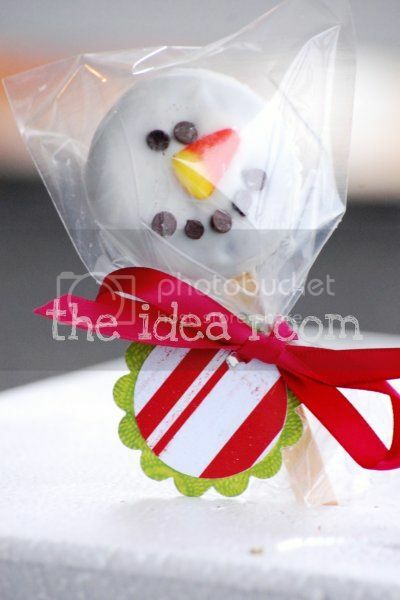 Next months party is going to be snowman themed (since there isn’t a noteable holiday to celebrate) – these are going to be my bring to the party treats! Thanks so much! these turned out great but i found out a few things, like use double stuffed and when inserting the stick twist… and you can use almond bark to dip them in but the most important is that the melts not be to warm.. or it will melt the middle of the cookie and fall apart or not to cool or it will be to hard to push through the frosting that the cookie will fall apart.. when you have the right temp.. it works perfect! Thanks so much for the feature! I always appreciate it. And thanks for letting me know! What a fun idea! I love snowmen and I love oreos so this combination is more than appealing! I do wish I’d thought of saving some candy corn from Halloween though. This was the ultimate pinterest FAIL!!!! lol It impossible to get the popsicle sticks into the double stuff oreos without them breaking or falling apart. It was a complete disaster. Any tricks you care to share on how to do this?? thanks! Oh shoot! Glad you got them to stick together!! Hopefully you sharing that might help others who are having a problem!! Don’t even try double stuffed Oreos w/ Popsicle sticks or you will end up with a crumbly mess. Oreo cakesters AND the white chocolate dipped Oreos!! With The dipped ones, the work was done for me!!! All I did was “paint” the face with melted chocolate and “glue” on the face (didn’t worry about the stick). The cakesters were the best for the stick, but used a great deal more chocolate for full coverage. Oh!! And it was super hard to find candy corn in December, song used Orange tic-tacs–perfect!!. But –all in all, with a little trial and error, it worked great and will be a hit!!! I absolutely LOOOOVE these snowmen! Even though I live in Australia and we usually have a scorching Christmas, I love these “traditional” white Christmas inspirations. I’ll make them for my son’s end of year party! Thank you for sharing and have a Happy Christmas! Yes! I am sure Christmas in Australia is a different experience that frigid Utah LOL! Thanks for sharing this with me! Hope you have a great Holiday! !